Who doesn’t love their delicacies? And Maharashtrians, otherwise simple folks, put a little extra love in their cuisine which is always served simply but with dollops of affection. Rice, curry and some homely vegetable preparations served with sweet and accompaniments often make for comfort food that is likely to make you realise what satisfaction really is. For this kind of an experience, we collated our favourite list of places across Mumbai that serves yummy and authentic Maharashtrian thalis. Read on. Located in Panch Pakhadi in Thane West is Khat N Ghat, a haven for Maharashtrian foodies. Known for fish, kothimbir vadi, crab soup, seafood and puran poli, they also have a range of thalis aka Maharastrian Tat. 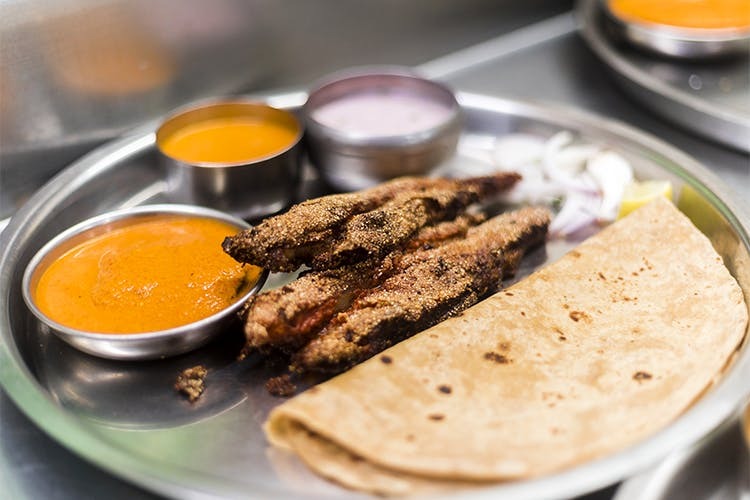 From Kolhapuri Tat to Malvani, Savji and Shakahari Tat, they have a chicken (INR 475) variant, a mutton (INR 575) variant and then a range of fish to choose from. With a friendly staff and simplistic interiors, Prabhadevi’s Hotel Gavkari is quite a popular option amongst those seeking Maharashtrian food. A wholesome thali that serves a choice of curry, dry, tambda plus pandhara rassa (if you haven’t had this, you’re defo missing out on things) and rice and chapati. Starting at INR 200 (egg thali), they have a host of chicken, mutton and seafood options. More than 100 years old, this small eatery tucked in the lanes of Dadar West serves all vegetarian thali during lunch time for a nominal INR 90. Go here only for the real taste. A casual dining option, Purepur Kolhapur is known for tambda and pandhara rassa, and a array of thali options (vegetarian, chicken, mutton and seafood) starting at INR 150. Old school vibes and cozy sitting instantly makes this the kind of place you can go to with your family. One of the highest rated Maharashtrian eating places, they have chicken, fish and vegetarian meals which are wholesome and yummy enough to make you want to come back. But if you’re headed here, don’t forget to try their range of home made ice creams.